At last I have now been to Japan. I have always been intrigued by their architecture and crafts, and also their unique character. And indeed it was just as I imagined it to be. Kyoto was so pretty especially with the blooming of the pink cherry-blossoms everywhere. It really felt like we were in the movie set of Memoirs of a Geisha! I was quite thrilled that we even managed to see some geishas/ maikos on the posh and quaint restaurant streets in Kyoto. Staying in a ryokan (traditional japanese inn) with sliding paper walls, sleeping on the tatami mat and experiencing the typical japanese bath proved to intensify the whole old-Kyoto experience. It was lovely. The best part though was to exerience the exact contrast of this traditional lifestyle with the ultra-modern Tokyo. The neon lights, extremely well-dressed but mostly crazily-dressed people, skyscrapers, rows of luxurious boutiques and train lines intersecting everywhere gave an adrenaline rush to the very cold days and nights in Tokyo. Well ahead of time architecture gave such an inspiration at a time when it is much needed. Although the food was simply excellent (hubby had a blast eating and scouting for food and snacks), I was dying for a simple plate of Aglio Olio by the end of the trip. 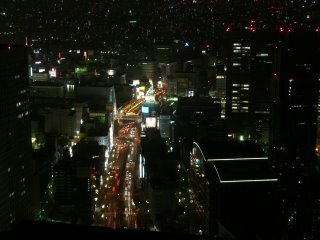 * the photo of Tokyo skyline was taken from the 'Lost in Translation' bar where we saw Jon Bon Jovi!! What a thrill it was!